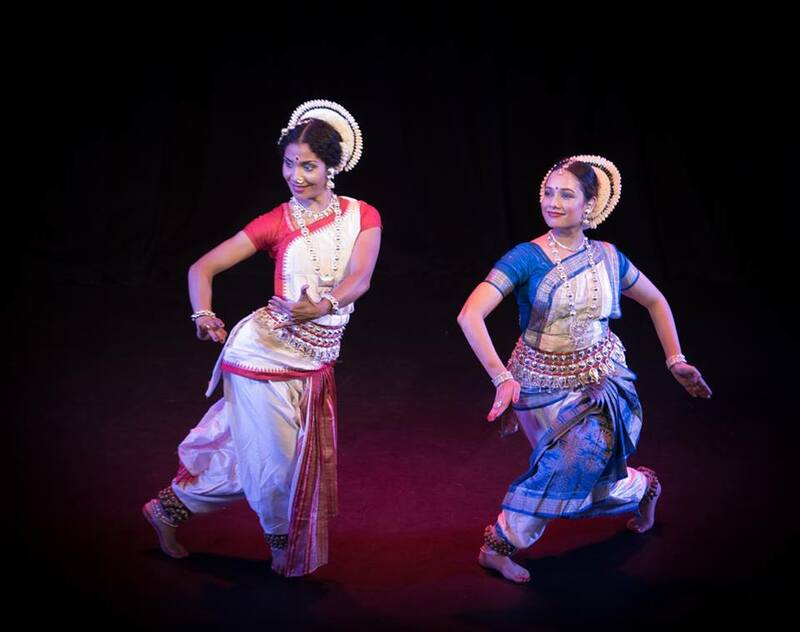 It’s happily a busy summer for odissi lovers. 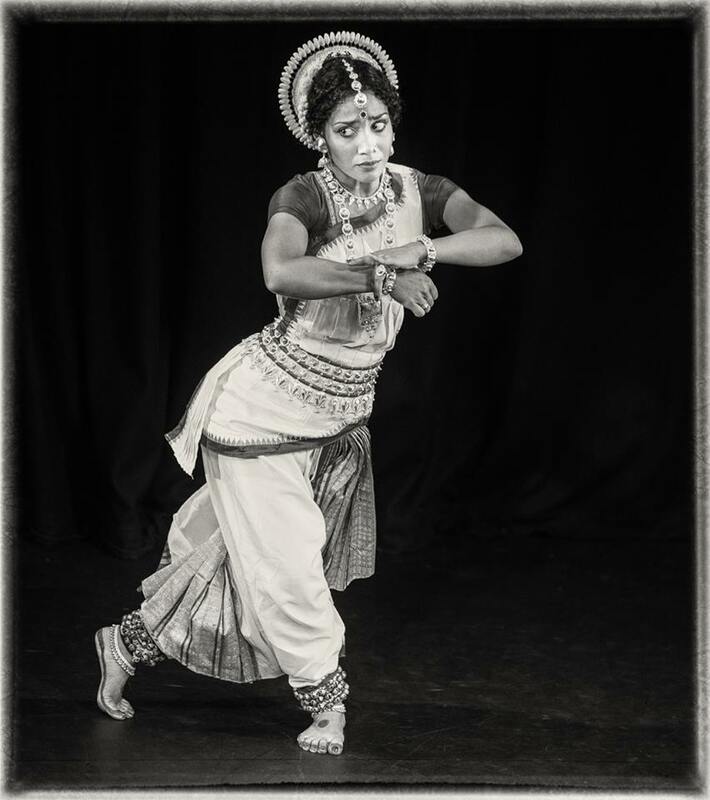 The profile of odissi in the UK is increasing, with practitioners ambitious to extend the reach and appreciation of the form. Trigunitam (‘triple’ in Sanskrit) was an expression of this urge and a contribution to the cause. 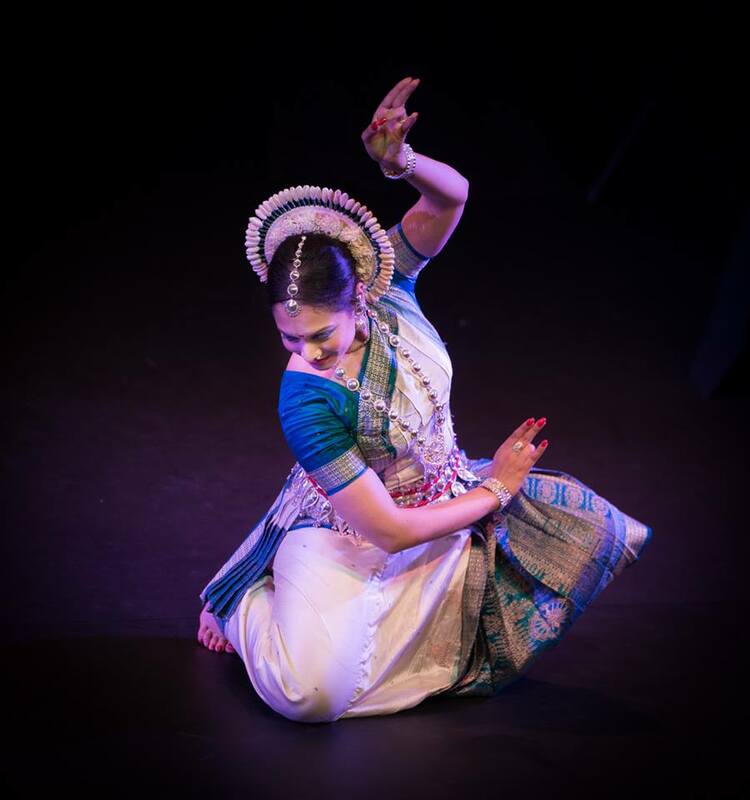 Steered by Tiyasha Dutta Paul, she, Rani Natalie Rout and Raj Masilamani performed a series of items, as an ensemble, as duets and as solos. Well-known pieces were refreshed with choreographic and musical variations arranged, respectively, by Tiyasha and Raj. There was variety in mood and expression, the lighting was sympathetic and brought out the best in performance, and the evening was a good length, at just under an hour and a half without an interval. It was helpful to have the items introduced (by Anusha Subramanyam), who also evocatively sang the opening invocation as the lamps were lit. 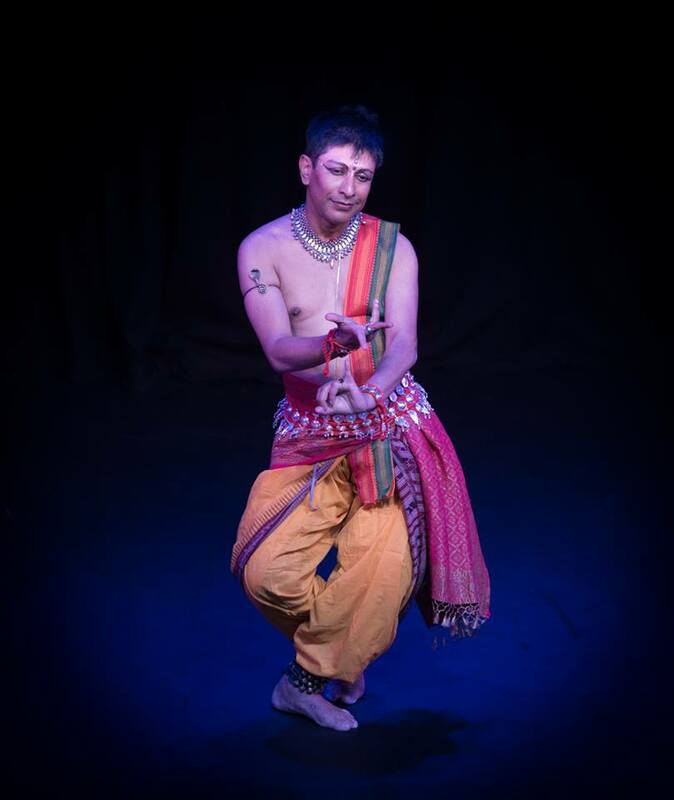 The first item, ‘Shyamal Dantakam’ an invocatory item in praise of Raja Matangi, was effectively presented as an ensemble piece. Particularly appealing were the nritta (pure dance) sections choreographed by Tiyasha Dutta Paul as duets danced by Tiyasha and Natalie. There followed solos by each of the dancers; a Pallavi arranged as a duet; and to end, a solo by Raj. Natalie’s ‘Varsha’, the second item in the programme, brought a change of mood, powerfully communicating the rainstorm. Her dancing was centred and well-controlled. Raj’s solos were let down by apparent nervousness, although he seemed more comfortable and expressive when seated – he made eloquent use of his eyes, face and hands both in in ‘Hari Iha’ and in ‘Kuru Yadu Nandana’, the final item. Very strong were the duets arranged by Tiyasha for herself and Natalie, not least because they communicated their pleasure in dancing them. 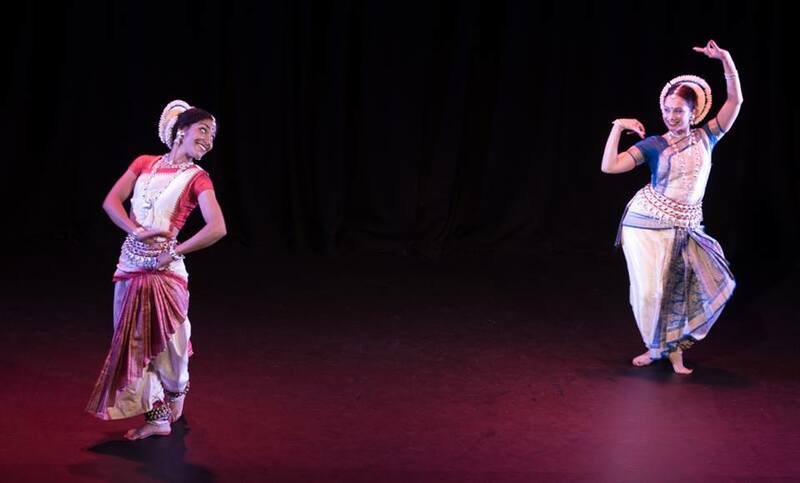 In ‘Yugmadanda Pallavi’ the two held the audience with their lively and dynamic interaction and movement through the space, together and apart. Tiyasha’s ‘Pathha Chhadi De’ was danced with complete conviction. She became Radha and Krishna, not just on one level but on several, coquettish, or expressing karuna, joy or love. She was immersed in the performance, with strong technique, dancing with clarity, expression and maturity. It was a commendable and enjoyable evening, but the programme could have been better balanced had it finished with a moksha, danced by the ensemble. An outside eye would have been able to make the best use of three dancers at different levels of technical proficiency and performance maturity. Odissi has been offered this year at the Bhavan Summer School, with a performance on 15 July; the Odissi Ensemble is touring with Sacred Shapes; Ananda Arts is offering a Summer School in Bedford in August for the second year; informal outdoor ‘stepping’ sessions take place; and Nrityasha is planning an Odissi Festival in September.